How to make high quality silicone tires in the comfort of your own basement. What we will be doing is making a two-cavity tire mold using casting resin to form the mold around an existing pair of tires on their wheels. The resulting mold may not be the best for full-scale commercial production, but will be great for casting your own in. Okay, I confess to using a machined aluminum mold to cast my Road Monkeys brand tires in, but I also use these resin type molds for other kinds of silicone tires I use myself. 1. Get a piece of 1/2″ plastic 2″x4″ (plexiglass works well, or glue several thinner sheets together to build it up to 1/2″ thickness) and drill a 1/4″ hole in each corner. 2. Place a 1/4″ x 1″ long bolt in each hole and fasten with a nut, these are the mold’s legs. 3. Lay a pair of good tires on the wheels face down on this sheet of plastic, spaced 1/2″ apart. An old set of AJ’s silicone tires work very well for this. 4. Draw a reference circle around each of the tires and mark their centers. 5. Drill a 1/8″ hole through each center mark. A drill press is best but not mandatory. The key here is to make the holes perpendicular. 6. Make a 1/2″ dam around the edges of the plastic sheet to contain the casting resin. Use scrap plastic, tape, modeling clay or anything that will contain the resin while it cures. 7. Spray the tires well with PAM cooking spray as a mold release agent and work it into them. 8. Cut a 3″ axle in half and use each half as a mounting bolt. Place a stop collar on each on the non-threaded end (sold in hobby shops for model aircraft wheel locks). 9. Put the axle stubs up through the plastic sheet in the holes you’ve drilled and mount the oiled tires on them FACE DOWN. Screw the tires right down onto the plastic snugly. 10. 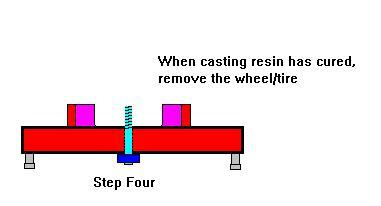 Pour 2-part casting resin around the tires to the top of them and allow to harden. Alumilite Casting Resin is what I use. 11. 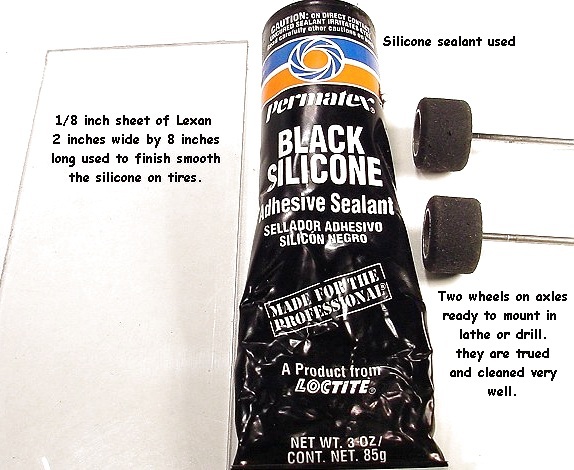 Once the resin has cured, remove the axle stubs and pull the tires out of the resin carefully. If done correctly, you now have a two cavity mold for the diameter of tire used as a master. 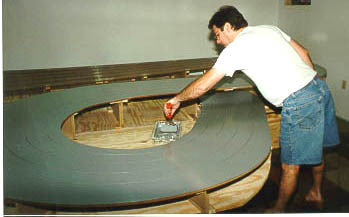 In this mold, you can place many types of wheels and cast any width of tire from narrow ones up to a width equal to the mold’s depth. 1. Spray the mold you’ve just made with PAM cooking spray. 2. Use the axle stubs and mount the wheels you wish to cast tires onto. Mount these by screwing them into the mold FACE DOWN, tight against the mold bottom. 4. Pour the RTV silicone mix into the mold, around the wheels. Pour a little at a time and let it settle for a minute, then pour more in. 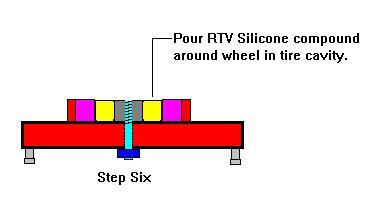 Repeat until the silicone reaches the wheel back’s level. 5. Run a small brass wire around inside the mold next to the wheel 5 times to break bubbles loose. 6. Allow silicone to cure fully. 7. 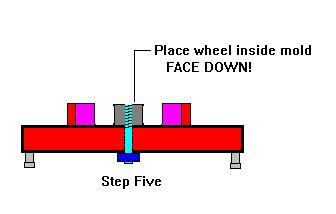 Once cured, remove the axle stub part of the way and use it to push the wheel/tire out of the mold SLOWLY. Do not rush this part. 8. Excess RTV can be trimmed when the tire is partly out of the mold or after completely out. Chapter Three – DUH, WHAT IS THIS STUFF ANYWAY? Casting Resin: Alumilite Casting Resin (kit). A user friendly kit with a two part resin that cures in 3-5 minutes. Great instructions and sold by many hobby and craft shops. RTV Silicone: Alumilite brand “Quick Set” A very good silicone compound to begin casting tires with. Easy to use and cures in 6 hours (completely in 24 hours). This comes in a 1 pound kit from Alumilite for about $27 at most hobby shops. Instructions are in the box. This is mixed 1 part activator to 10 parts rubber base….best done with a dixie cup and an eyedropper. Use the eyedropper with water to mark 10cc in the base of a dixie cup. Then spoon in the rubber base into the cup to that level. Pick up 1cc of activator with the eyedropper and place it in the cup….stir well until the color is evenly mixed. At this point you can add the tire coloring. Powdered fresco tempera coloring is found at art and craft supply stores. “Dry Temp” brand (Palmer Paint Co.) works well. Place some in the RTV mixture in the dixie cup and stir well. Add more until you get the shade you desire. Dry Temp does not affect Alumilite Quick Set’s curing at all. Liquid tempera coloring may however and has been known to leech out of some silicone types. That’s really all there is to it. 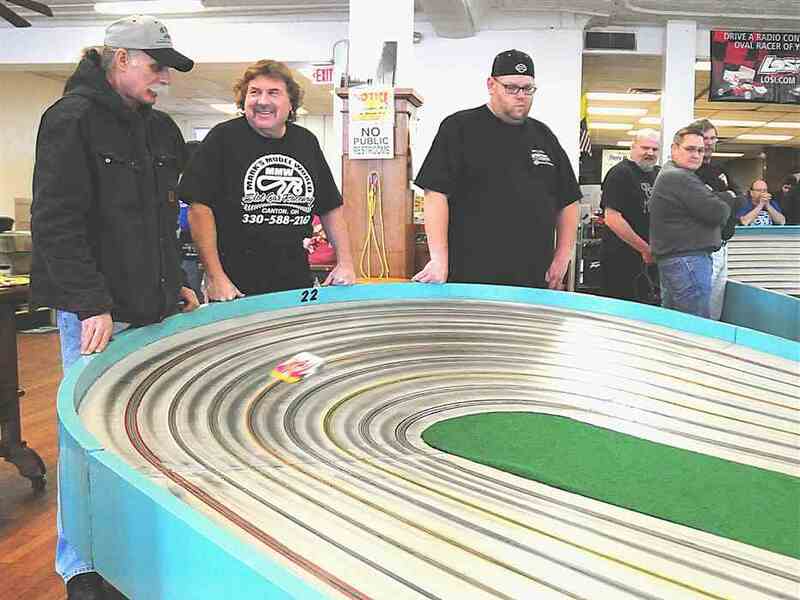 As with anything, a little practice goes a long way, but you should be getting usable tires from the start. Some variations on the mold making and you will be able to make scale sidewalls on your silicones as well, depends on the master tire. I have drawn a simplified version of this in six easy steps from start to finish. While it illustrates a single cavity mold, it will give you something to look at while you read the more detailed process steps. Now you also can be as “tired” as I am. Good luck, have fun, and remember; it ain’t rocket science! BTW- Thanks to George Lowe for helping me get started in this tire casting stuff! As described in the above article. Alumilite Kit includes all the goodies plus casting instructions. Sells silicone and casting resin that work. The silicone is softer than Alumilite Quick Set, but still good. 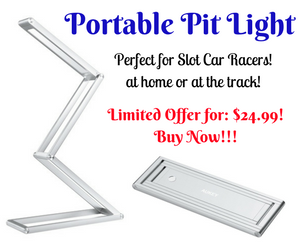 A two pound kit is $27.50 with shipping.